Copies of Giftbringer were distributed during the Christmas season, many as gifts. People from different parts of the country have now had a chance to share their responses. Every so often I receive a book for young adult readers that does not come from either a famous publishing house or author, but stands out from the stacks of books I am requested to consider for review. 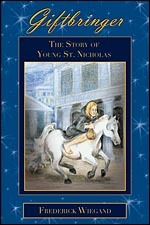 Making this even more interesting it that, here in April, the book has its genesis in Christmas as Giftbringer: The Story of Young St. Nicholas by Frederick Wiegand ($19.95, Tate Publishing, LLC, 127 East Trade Center Terrace, Mustang, OK 73064,  361-9473, softcover). As the author notes, there is the St. Nicholas—Santa Claus—of myth, but there really was a St. Nicholas who lived in the days of the Roman Empire. Born to wealth, he became famed for his gifts to those less fortunate them himself. What might his youth been like? That question is answered in this collection of stories about his imagined youth and it makes this a book that can be read, not just at Christmas time, but any time. There is a Christian theme that runs through these stories, filled with many interesting characters. Read it for entertainment. Read it for inspiration, but read it. Thanksgiving is over for another year. Of course, as usual, I overate. It's so good, though. Now with Christmas just a few weeks away, I wanted to tell you about a book that one of our local residents wrote. It's called "Giftbringer." The author is Frederick Wiegand of Fairfield. The book is about a young boy destined to become one of the world's most beloved figures. He is born to wealthy parents and his name is Nicholas. 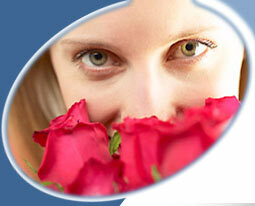 He has a life-changing encounter with God, which transforms him into the legendary Giftbringer. The story is set for a series of secret Christmas gifts that will establish Nicholas' reputation as the greatest Giftbringer the world has ever known. This story will warm your heart and renew your spirits, not only during the Christmas season, but throughout the year. Frederick Wiegand is a teacher and semiprofessional actor in Fairfield. He is a native of Seattle and holds two bachelor of arts degrees from the University of Washington and a master of science degree in special education from National University. When not writing books, he directs and performs in plays and musicals at New Life Church or with local theater organizations. He enjoys traveling and researching various countries and cultures. Wiegand had a large family, and Christmas was an exciting and wonderful time in his house. The author's interest in St. Nicholas is an outgrowth of a lifelong fascination with Christmas traditions and customs. "Giftbringer" is his first novel in series about the life of St. Nicholas. "Nearly every book about St. Nicholas focuses on Santa Claus," Wiegand explains. "I wanted to explore the character and personality of the figure who inspired the holiday icon. Who was St. Nicholas? This book attempts, imaginatively, to answer that question." This book is on most bookstore shelves and makes for good reading and a great gift. I just finished reading Giftbringer and it left me with a feeling of "Wow! I want more!" Every legendary figure in our own mythos begins in historical fact somewhere and throughout the ages the story keeps getting more embellished down the centuries, so I see no reason why the story of Father Christmas should be any different. Frederick Wiegand has blended that historical fact with his own imagination. As someone who has read both Harry Potter and Giftbringer I can say that Mr. Wiegand's imagination has proved just as insightful as J.K. Rowling has with Harry Potter, except no witchcraft, so if you didn't want your children reading about Hogwarts then this is the perfect alternative. The characters are just as rich and believable and you are drawn to a time long ago but only an ocean and sea away. If, like myself, Christmas is your favorite time of year then Giftbringer is a must in your library right next to A Christmas Carol because his book allows for children of all ages who have forgotten to again become both enraptured with the Christmas Spirit and to be more fully aware of our own individual giving nature. This nature, bestowed upon us by the force of creation reminds us of the responsibility to use this gift wisely, which, in turn, leads us to then to a deeper understanding of the miracle this holiday offers us every year and to practice that same miracle more often in our daily lives by enriching the spiritual being of everyone we come into contact with in our daily lives. In today's, unfortunately, politically correct climate Christmas has become both a nine letter word and a commercial lunacy; however, if you only buy one more book this year make it Giftbringer and allow this wonderful story to take you on a journey of joy you so richly deserve but remember to share that same joy with your posterity so that they will never forget what the spirit of Christmas really means. Latest Oz readings? I just finished Giftbringer by Frederick Weigand, an historical novel about St. Nicholas. No, not Santa Claus, but the real St. Nicholas. So how is that Oz? It's not, except that I've known Rick Weigand for several decades now, as he is from Seattle and is one of the original Oogaboos, our little Northwest Oz society. Giftbringer is a pretty good little book. The message can get a little heavy-handed in places, but overall I found it enjoyable, and a credible extrapolation of what little is known about Nicholas. As this is the first of a projected series, we all have something to look forward to. As the holidays near, we can't help but notice the inevitable shift that comes over our communities; traffic to the mall increases, people start buying more, canned food drives abound, and most of the time it just generally starts to feel like Christmas. Frederick Wiegand, one of Armijo's own teachers, is the author of this month's book: Giftbringer. This book, appropriately enough, is not just a story of Christmas, but of true generosity and the meaning of Christmas. Giftbringer is the story of young Saint Nicholas and his transformation of personality as he becomes whom we know today as Santa Claus. The story begins in the city of Patara in ancient Turkey where Nicolas is born to wealthy parents. Like most children, he does not start out knowing to share or be generous, and resents his parents' decision to give away their wealth to the needy rather than spend it on him. The story follows his transformation and, in each encounter, Nicolas gains some maturity. After all of his trials and tribulations, Nicolas is at the end of the book just starting to come into his seemingly predestined role of Giftbringer, with a long ways to go before becoming the jolly old man in a red suit. Giftbringer is a fiction presented in a historically accurate manner and offers interesting speculation as to the origin of the tale of Saint Nicholas. It also ties in something that has been slightly lacking in the tale, which is Christianity. Saint Nicholas is not just generous, but a devout priest. In this way, he is more closely associated with what many refer to as the "true spirit of Christmas." This book struck me as a more realistic transformation; Nicolas is a human character, who can be selfish and needy, like most children. A good read for the holiday season, and for anyone who has ever been curious as to the legend of Santa Claus.